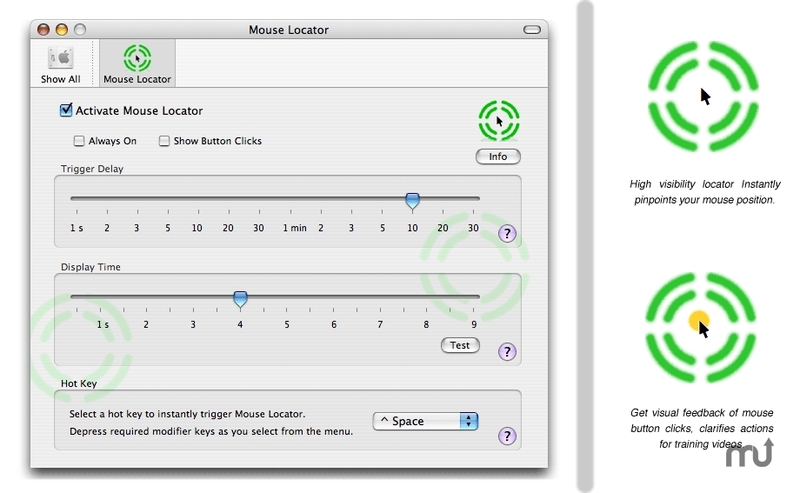 High visibility locator instantly pinpoints your mouse position. Is there a better alternative to Mouse Locator? Is Mouse Locator really the best app in System category? Will Mouse Locator work good on macOS 10.13.4? Mouse Locator creates an outline over your mouse cursor so you can find it on the screen instantly without hunting for it. It automatically triggers after a controllable time period, from 1 second to 30 minutes. Universal Binary, for Macs powered by PowerPC or Intel processors. French localization of preference pane. Extra locations for custom graphics. Infinite setting for trigger time. Infinite setting for delay time. Fix for 'white square' bug on DVD player.